The yearly value of Taiwan mushroom industry (excluding medicinal mushrooms) reaches NTD 8.8 billion, accounting for about 18% of total production value of the vegetable industry. And the richness of Taiwan's mushrooms, both in terms of variety and quality, offers excellent consumer choice among assortments for high-fiber foods as well as for health caring. The most common method for growing mushrooms is growing them on sawdust in plastic bags (the local farmers nickname them ‘outer-space bag’). Nevertheless, sawdust supply is declining and its price spiking in recent years because the sawmill industry with planted forests in Taiwan have waned considerably over the past decade. Thus, it is critical to seek potential alternative substrates to replace sawdust. Taiwan produces about 1.3 million ton of rice straw from 240,000 ha of paddy rice field every year. And the re-use of this agricultural waste will be economically profitable not only for the farmer but also for the agriculture at large. In this context, TARI scientists have recycled rice straw as mushroom growing substrate. After chopped into different lengths, the rice straw is mixed with sawdust as mushroom growing substrate and filled into the plastic bags or cultivation bottles. 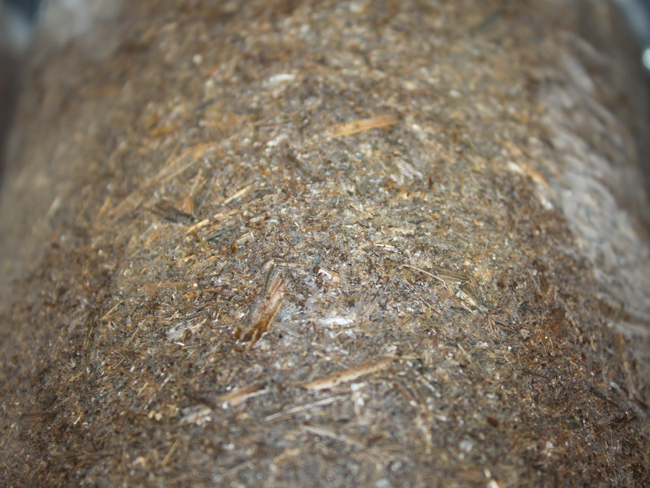 The study shows that the yield of oyster mushroom (Pleurotus ostreatus) on the substrate with 1:4 to 1:2 ratios of chopped rice straw and sawdust is comparable to those grown on the 100% sawdust substrate. This translates into a saving of about NTD4500 for the substrate of 10,000 mushroom-growing plastic bags. King oyster mushroom (Pleurotus eryngii) is the third popular type of mushroom produced and eaten in Taiwan. And TARI scientists have found its spent substrate still contains relatively high concentrations of nutrients. Without composting, the spent king oyster mushroom substrate can be mixed with sawdust and replace parts of new sawdust to grow king oyster mushroom, oyster mushroom, shiitake (Lentinula edodes), almond mushroom (Agaricus subrufescens) and shimeji (Hypsizigus tessellatus). The replacement ratio is from 1:3 to 3:4. The mushroom yields grown with parts of the spent king oyster mushroom substrate are comparable to those grown with 100% new sawdust. 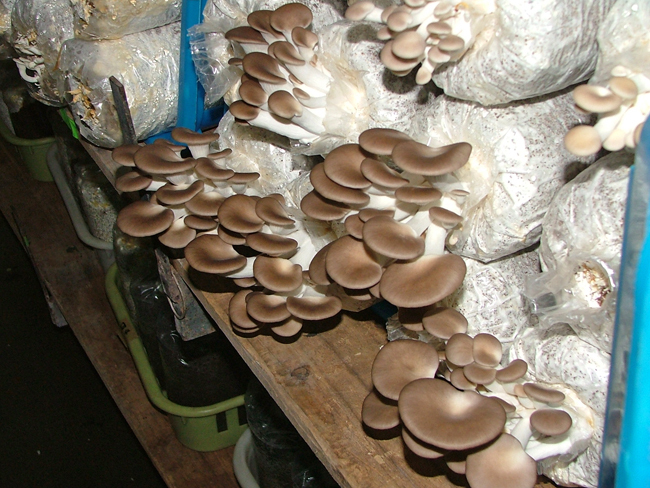 Even better, shitake grown with one-third of the spent king oyster mushroom substrate has 20% higher yield than those grown without the spent substrate. The aforementioned indicates that the spent substrate of king oyster mushroom has a high potential to be reused for commercial cultivation of the mushroom.